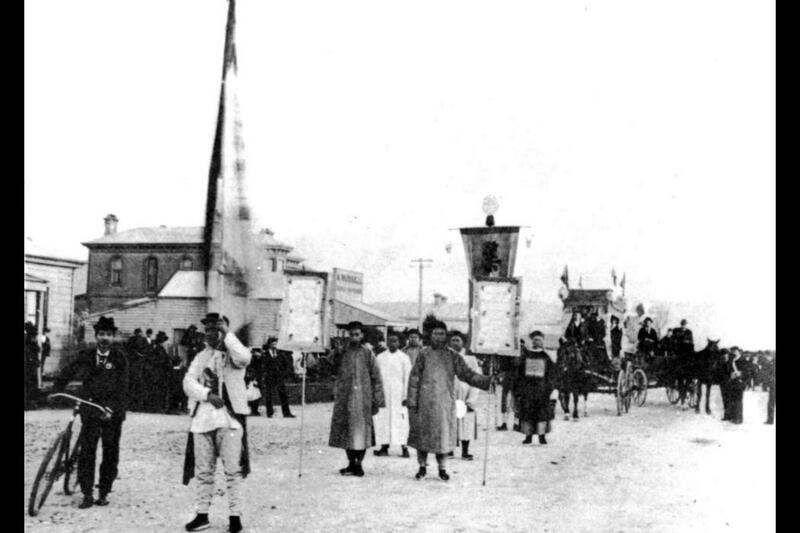 Chinese goldminers procession Greymouth, 1897. Queen Victoria’s Jubilee. A.C. Graham photographs (MB1065, Ref 19784). Macmillan Brown Library, Christchurch, New Zealand. This year, we acknowledge 250 years since the arrival of the HMS Endeavour at Tairāwhiti where the first formal meeting between Māori and Europeans occurred. Tuia – Encounters 250 is an opportunity to acknowledge the arrival of all people to New Zealand, from the thousands of years of Te Moananui-a-Kiwa (Pacific) voyaging to those we welcome today. In the 1860s the gold rush had attracted Chinese migrants coming to New Zealand. They first settled mainly in the South Island, in Otago and Southland. Then moving across to West Coast goldfields in 1870s. As the gold ran out, they began to move north. This week's image shows the Chinese goldminers who took part in the Queen Victoria’s Jubilee Procession in Greymouth. See this photograph and more in Kā kohika, our art and archives catalogue.